Home / NAFTA / Will A NAFTA Deal Be Struck (in principle) Next Week? Will A NAFTA Deal Be Struck (in principle) Next Week? Whiplashed? Last weekend, President Trump threatened again to walk away from NAFTA. Within 48 hours, reports suggest he wanted an agreement at next week's Summit of the America (April 13-14 in Peru). The art of the deal is getting to the deal. After 15 months in office, some political commentators suggest Trump is feeling more comfortable as President. Investors also becoming more familiar with his style. Bold demands. Compromise. Deal. One of the stickiest issues is about the US demand to lift the domestic content threshold from 62.5% to 85% for car parts to be qualify for duty-free trade. Some producers as this is impossible to achieve currently, which is a way to say that the US demand was over the top. Reports suggest the US has signaled a compromise. The idea is to break down the car parts into five categories. Each would have a different domestic content requirement. The 85% threshold may apply only to the major components, like engines and transmissions. The simplest of the 30,000 parts in a car, like a nuts and bolts, might not have any threshold. US Trade Representative Lighthizer has urged that a deal be found before the July 1 Mexican elections, but neither the approaching election nor the fact that the leftist AMLO is still ahead in the polls has been a factor for investors. The peso itself is the strongest currency in the world since the end of last year, rising 8.75% against the greenback and nearly 9.5% against the Canadian dollar. The US does not want to deal for Mexico sake. July 1 is also when the President's trade-promotion authority expires. The White House made a formal request to extend the TPA at the end of March. It is not clear whether Congress will renew it. Neither chamber is required to affirmatively approve the renewal, but either can prevent it from being extended. The White House could be seeking an agreement next week, at least in part, because the rules under TPA require that the president gives Congress at least 90 days advance notification and to publicly release the text of the renegotiated agreement 60 days beforehand. With TPA authority to end at the end time is of the essence. With the US seeming to push hard for a deal, Canada seemed less enthusiastic. Canada's ambassador to the US was skeptical, saying he did not know was an agreement in principle looks like. The devil is the details. He suggested that an agreement in principle with the details to be worked out later is dangerous. Still, a NAFTA deal, following the heels of KORUS, would be a success for the US President. Also, it would strengthen his hand in dealing with China by showing he is reasonable and is not being provocative just to be provocative. If the administration's goal is to get rid of the US trade deficit, it is bound to fail. The broad measure of US trade, the current account balance, is a function of numerous forces, including growth differentials, and of course, savings and investment. The large dollop of fiscal spending when the economy is already growing near trend is expected to spur a widening of the US trade deficit. Earlier today, the US reported the sixth consecutive wider trade deficit. The $57.6 bln shortfall is the largest since October 2008 and it comes despite the improvement in the energy trade balance. 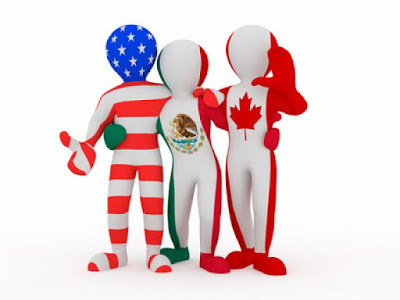 The US bilateral deficit with Canada fell (to $400 mln from $3.69 bln deficit in January, not seasonally adjusted), while the deficit with Mexico rose (to $6.06 bln from $4.05 bln in January).